The Hubble Space Telescope (HST) is a space telescope that was carried into orbit by the space shuttle in April 1990. It is named after the American astronomer Edwin Hubble. 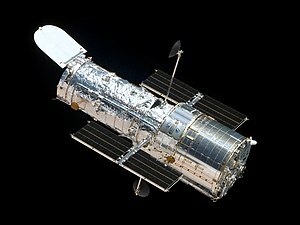 Although not the first space telescope, Hubble is one of the largest and most versatile, and is well-known as both a vital research tool and a public relations boon for astronomy. The HST is a collaboration between NASA and the European Space Agency, and is one of NASA's Great Observatories, along with the Compton Gamma Ray Observatory, the Chandra X-ray Observatory, and the Spitzer Space Telescope. Space telescopes were proposed as early as 1923. Hubble was funded in the 1970s, with a proposed launch in 1983, but the project was beset by technical delays, budget problems, and the Challenger disaster. When finally launched in 1990, scientists found that the main mirror had been ground incorrectly, severely compromising the telescope's capabilities. However, after a servicing mission in 1993, the telescope was restored to its intended quality. Hubble's orbit outside the distortion of Earth's atmosphere allows it to take extremely sharp images with almost no background light. Hubble's Ultra Deep Field image, for instance, is the most detailed visible-light image ever made of the universe's most distant objects. Many Hubble observations have led to breakthroughs in astrophysics, such as accurately determining the rate of expansion of the universe. Hubble is the only telescope ever designed to be serviced in space by astronauts. Four servicing missions were performed from 1993–2002, but the fifth was canceled on safety grounds following the Space Shuttle Columbia disaster. However, after spirited public discussion, NASA administrator Mike Griffin approved one final servicing mission, completed in 2009. The telescope is now expected to function until at least 2014, when its 'successor', the infrared James Webb Space Telescope (JWST), is due to be launched.